In general it is fairly easy to calculate the revenue per product and service, and also revenue per customer. However, the profitability equation for costs is harder to pinpoint. Indeed, many organizations do not know the true cost of their customers / products / services. While some organizations calculate these costs, their managers may question the results. Since they do not fully grasp cost behaviour and the impact that has on profitability per customer, product and service, their decisions may not be fully informed. In fact, it is not easy to make decisions about improving company profitability without fully knowing what areas need to be improved. Once they have identified the business practices that require changing, organizations can quickly move to increase their profitability. 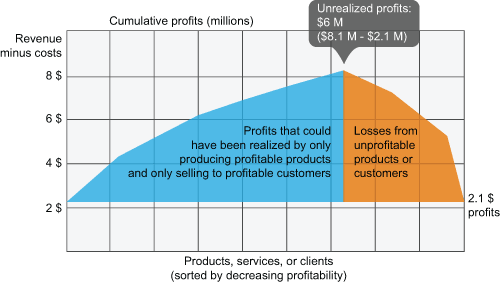 an organization has the potential to make $8.1 M in profits but sees its profit reduced to $6 M by selling unprofitable products, or by selling profitable products to clients who, although initially profitable, are no longer so due to distribution costs, after-sales service, etc. With the Decimal Suite, users can model cost behaviour based on cause-effect relationships. Results can be analyzed from various angles, enabling managers to better understand the results and improve the organization’s performance.